Improving the world using PowerShell, ALM, PowerBI, and more. I've been having a lot of fun with the Bot Framework recently, and today I'm publishing my second project (the first was http://jsontocsharp.net/) built with this amazing framework - Chat Bot Slots. 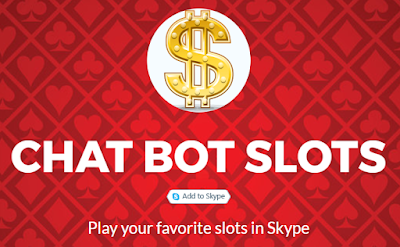 It's a very simple slots game, which runs entirely in a Skype chat. The game stores all profile data in a CosmosDB, so all your winnings are safe and quickly accessible across the globe. The UI is based on Prompt dialogs and built-in Skype smileys. 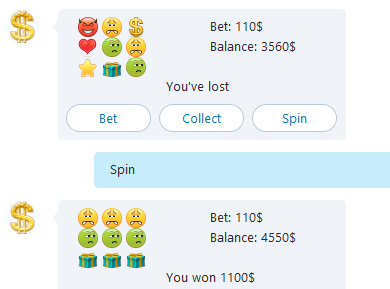 Note - due to weird Skype bug, if you use a lot of smileys in your messages, some of them just randomly disappear, so after some trials I've just found and used some that are not affected by this issue. The game was created just for fun, the player always (well, almost) wins, so go spin and enjoy it!